(Notes on) Politics, Theory & Photography: May Day! © The Estate of Tina Modotti. This photo seems an appropriate way to mark the Holiday for two reasons. 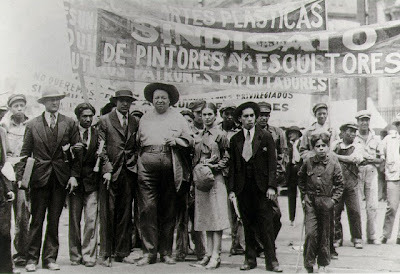 First, Modotti, Rivera & Kahlo are all terrific artists. Second, many May Day celebrations this year - like last year - will be focusing on securing'defending the rights of immigrant workers and a large percentage of such workers in the US are from Latin America - go here and here for information. May Day was invented (quite literally) in 1890 by European Socialists as part of the campaign for the eight hour day. One of the first papers I ever published used it as an example of an "invented tradition" with crucially important strategic implications for working class politics at the turn of the last century (making an odd couple of historian Eric Hobsbawm and game theorist Thomas Schelling). This basic idea mushroomed into my doctoral thesis. So I have a particular personal fondness for this holiday. As an historical example, it demonstrates (no pun intended) the way political possibilities can be opened even in seemingly dark times.